Beauty sleep is real! How lack of sleep is ruining your skin. It is ok to cancel plans to say “I need my beauty rest” because beauty sleep is real. The quality and length of sleep you receive every night can have a profound impact on your skin’s overall health. When we sleep our bodies recharge. Not only do our bodies recharge, our skin does as well. During sleep we heal, restore and eliminate toxins from the skin. If sleep is compromised so is the body’s ability to carry out these essential skin functions. During the first three hours of sleep your body will start producing the human growth hormone from the pituitary gland. As we age, this hormone is necessary for the maintenance of youthful and radiant skin. Without this hormone release skin is not repaired from daily damage and thus induces the aging process. The middle two hours of sleep is when melatonin is increased. Melatonin is a hormone that is responsible for regulating your circadian rhythm (sleep/wake patterns) but also acts as an antioxidant that helps protect the skin from damaging free radicals. The final three hours, or during the active REM sleep stage, levels of cortisol (aka the stress hormone) decrease. The skin’s temperature also drops to its lowest point allowing muscles to relax and become immobile, giving skin its deepest recovery of the night. If that wasn’t enough reason to crawl into bed for a goods night rest. Here are the 5 ways lack of sleep is ruining your skin and wrecking havoc on your appearance. There is a direct correlation between stress and the onset of hair loss. Reports show that sleep deprivation is a ruthless form of stress to the body. Which is basically an indirect way stating that lack of sleep (increase in cortisol and stress levels) can cause premature hair loss. When you miss sleep your cortisol levels increase. Cortisol triggers inflammation. Inflammation breaks down the proteins in the skin that keep skin radiant and smooth. When you are tired the blood in your body is not flowing efficiently which normally results in a lack of oxygen in the blood. This lack of oxygen causes your skin to appear ashy, pigmented, or blotchy. Did you know that during sleep you perspire more? It’s true. While you are asleep your body’s hydration rebalances and recovers extra moisture. This makes sleep a natural moisturizer that can help to smooth out wrinkles on the skin. If you miss out on sleep it can also affect the moisture levels in your skin and lower your complexion’s PH level. A skin imbalance is created when your PH levels drop. This imbalance causes your skin to not produce the moisture it so desperately needs, leading to drier skin. Dark circles are widely known common symptom of not sleeping. Lack of sleep makes your blood vessel dilate leading to dark circles. You will also find that not sleeping enough can result in poor water balance that creates dark circles and puffy eyes. When you sleep on your stomach liquid can drain and catch in the trough of your under eye and cause inflammation and puffiness. When you miss out on sleep this directly applies stress to the body. Chronic stress harms the integrity of the collagen in skin. Collagen is an important ingredient in the elasticity and structure of skin. When collagen is broken down, the skin shows more noticeable signs of aging by becoming thinner and less firm. 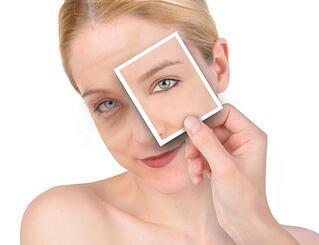 When skin is thin its appearance is less smooth and subtle and showcases wrinkling more prominently. Limit alcohol and cigarettes before bed. Keep up your sleep hygiene to promote a good night’s rest. Get high thread count sheets and pillow cases to help avoid any pulling on the skin. Wash your face nightly and apply skin care treatments which help promote a flawless complexion. If you are prescribed a CPAP machine, use it. Researchers recently found apnea sufferers who use their CPAP machines look younger and fresher than those who do not. 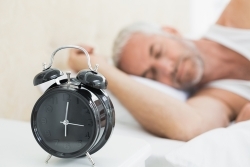 If you still find yourself having missing out on sleep even after practicing good sleep habits, you may want to talk to your doctor about your sleep problems and to schedule a consultation with a sleep specialist. At the Alaska Sleep Clinic we treat hundreds of patients throughout Alaska for various sleep disorders including: sleep apnea, narcolepsy, insomnia, restless leg syndrome, and more. Click the link below to receive more information regarding scheduling a sleep study.